JEFFERSON CITY, Mo. 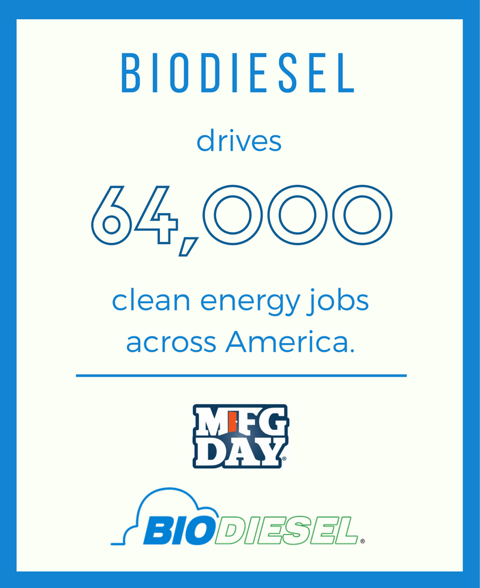 – Biodiesel is a driving force in America’s manufacturing sector, supporting more than 64,000 good paying, clean energy jobs across the country. These jobs are contributing to a vibrant manufacturing sector, reinvigorating rural economies and driving innovation. Manufacturing Day, which occurs on the first Friday in October, is an annual national event executed at the local level supported by thousands of manufacturers as they host students, teachers, parents, job seekers and other local community members at open houses, plant tours and presentations designed to showcase modern manufacturing technology and careers. For more visit, www.mfgday.com.